"Duck is one of the traditional meals for Christmas or other special occasions in Germany. I often make it in the fall or winter when I have guests over. The duck needs to marinate for at least 12 hours before roasting. We serve broccoli and duchess potatoes with it. The stuffing can also be used for other poultry as well." Combine onion, parsley root, carrot, rosemary, bay leaves, and white peppercorns in a bowl. Stir in white wine. Place duck in a large bowl and pour marinade over duck. Cover with foil and marinate in the fridge for at least 12 hours. Combine chestnuts, apple, bread, and egg in a bowl; season with tarragon, salt, and pepper. Remove duck from the marinade and strain marinade through a sieve. Dry duck inside and out with paper towels. Rub salt and pepper all over the skin. Fill cavity with stuffing, being careful not to overstuff. Secure opening with wooden skewers. Pour oil into a roasting dish. Add stuffed duck, breast-side up. Roast duck in the preheated oven, turning occasionally, until golden brown on all sides, about 20 minutes. Heat marinade in a saucepan over medium heat until warmed through, about 5 minutes. Pour warm marinade into the roasting pan. Cover with a lid or aluminum foil and return to the oven. Reduce oven temperature to 350 degrees F (175 degrees C) and bake duck until no longer pink at the bone and the juices run clear, about 90 minutes. An instant-read thermometer inserted into the thickest part of the thigh, near the bone, should read 165 degrees F (74 degrees C). Remove duck from the roasting pan and transfer to a baking sheet. Set oven rack about 6 inches from the heat source and preheat the oven's broiler. Roast duck until skin is golden-brown, 3 to 5 minutes. Remove duck from the oven, cover with a doubled sheet of aluminum foil, and allow to rest in a warm area for 10 minutes before slicing. Strain the stock, removing any burnt bits and skimming off fat. Heat stock in a saucepan over high heat and cook until gravy is reduced to 1/3, 5 to 10 minutes. Season with salt and pepper. 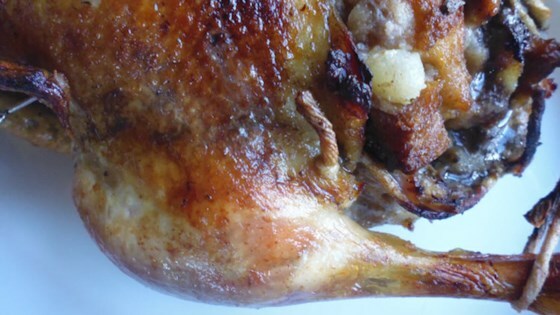 Carve duck and serve with gravy.